Undefeated for the entire league season! "The Invincibles - Men's 1s conclude an undefeated season with a 6-3 away win at Melton" claims Seb! Women's 1s win 4-2 at home against Beeston. 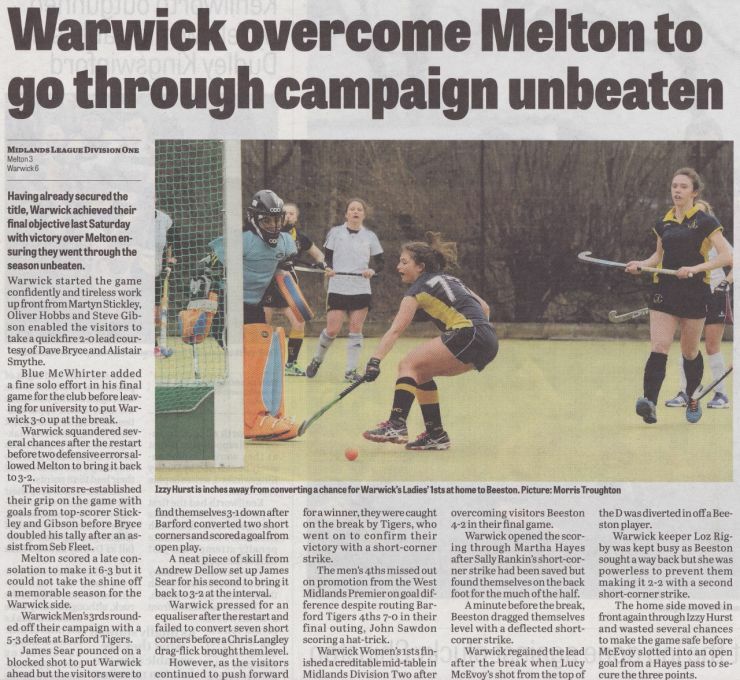 Look out for photos is the press this week, the Courier sent a photographer, see cutting below (I took some of my own too, take a look at our Women's 1s team page). 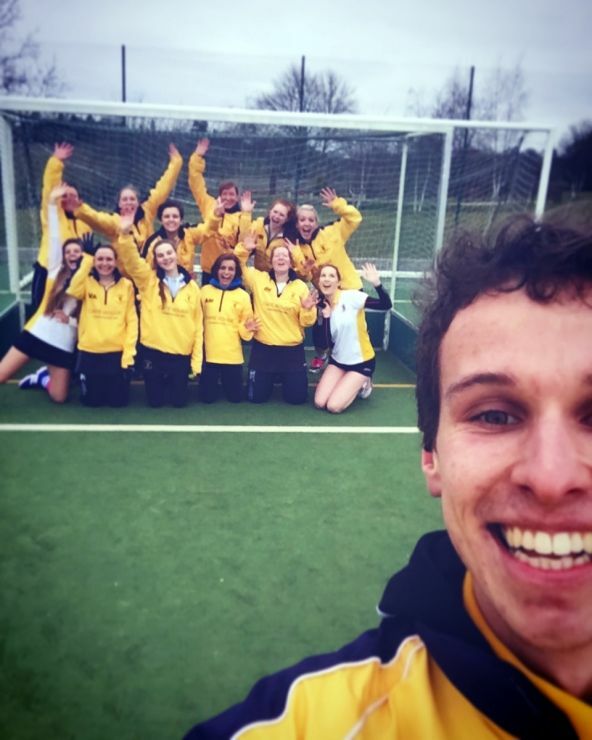 James Balfour sent in: "Men's 2s wrap up the season with a 2-0 loss to Worcester despite a strong performance to finish 5th overall". Our Women's 2s draw 2-2 away at Leamington to secure 3rd place in the league. 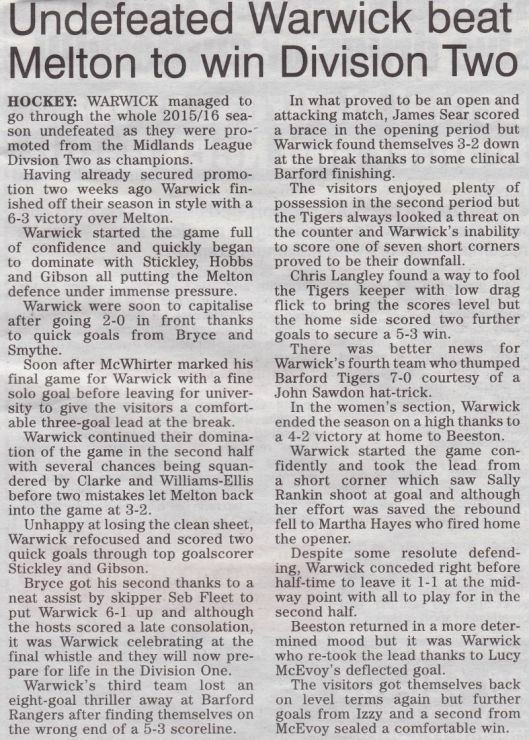 Chris Langley reports: "A good game of hockey at Barford Tigers with both sides showing skill and quality passing moves. If only we could have converted more than one of our 12 (or was it more) short corners we would have won instead of losing 5-3. Superb hospitality and teas made up for it, thank you Tigers. Mid table for us this year...about right!" 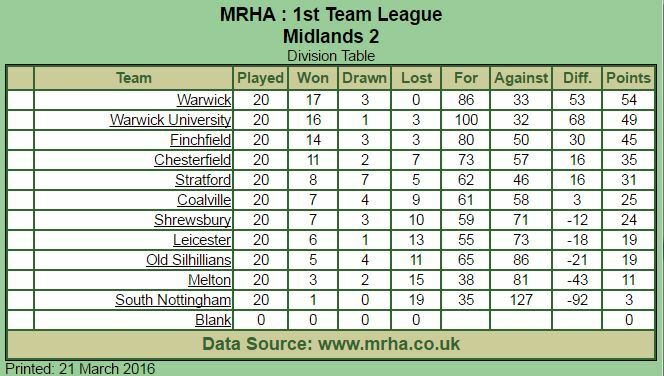 Our Women's 3s bang in 6 with no reply to win away at Leamington to secure 3rd place in the league. Is Hannah Wishart top league goal scorer? They also claim our first team selfie with Ed Wilson! Nick Anscombe writes: "A battling M4s won 7-0 against Barford Tigers but it wasn't quite enough to gain promotion, finishing 1 point behind top spot with John Sawdon scoring yet another hattrick!" No game for our Men's 5s this week but our 'eternal' Vets Captain Claudio Cardellino sent in: "Mens 5th team stayed at home because we'd already finished playing...Vets beat Hampton 4:3...after racing into a 3-0 lead with Paul Williams scoring the fastest ever vets goal ..25 seconds ..we let Hampton back in but finally edged them out". Andy Griffin reports: "Some debate over the Badgers score this week, it was either 5 or 6 nil to us. A stewards enquiry is currently underway". Well that's the end of the season for most of our teams. Our Badgers have a few more matches and our Mixed team are continuing their cup run, keep your eye on our news pages.